Brand new Dometic hard start capacitor. Turning on your air conditioner can take a lot of juice. Take the stress off of your air conditioner with a new hard start capacitor! This Dometic capacitor, model number 3310727.015 comes with a new mount strap and foam block. Measuring; 1-1/2" Diameter x 1-3/8" T (body) or 5" T (Total) with 7" Lead wires. The strap measures approx. 8-1/2." The L block measures 1-5/8" x 1-5/8" x 7/8." We only sell brand new Dometic replacement parts. 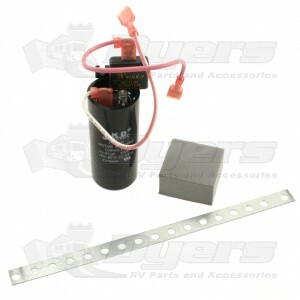 Come take a look at our giant selection of refrigerator replacement parts at Dyers, your RV superstore! Block: 1-5/8" x 1-5/8" x 7/8"